Home > Search training results > Part II: How do you help an organization become more Family-Driven? Part II: How do you help an organization become more Family-Driven? 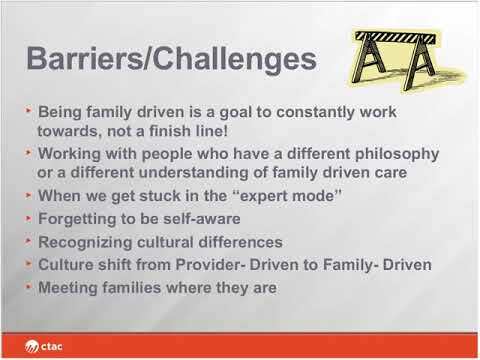 As a follow up to our last webinar, Family-Driven Care 101, this webinar will focus on supporting organizations to become more family-driven. The presenters will share the steps they took to ensure that their organization was family-driven. They will highlight specific principles of Family-Driven Care and how they can be applied to help other organizations move in that direction. Family-Driven Care means families are expert partners in the care of their children and should have a primary role in making decisions about the care their family receives. Families that are engaged in treatment for their children and work in partnership with their child’s providers experience positive outcomes and are able to make better-informed decisions.